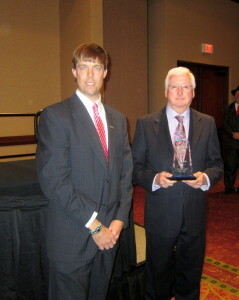 John Wise, right, with Vaughan Dozier, Chamber Board chairman. John Wise of Love Mitsubishi received the award for Business of the Year, chosen by the Greater Cayce-West Columbia Chamber of Commerce. Love Mitsubishi was given the Business of the Year award at the Greater Cayce-West Columbia Chamber’s 2015 Annual Dinner, Tuesday night.